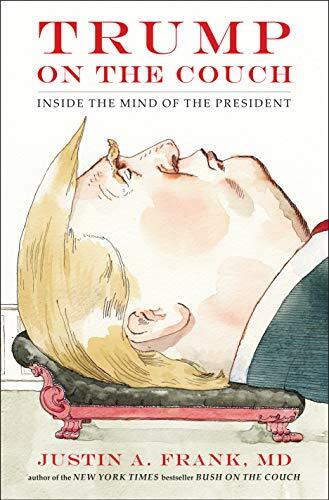 Comprehensive yet detailed, written with compassion and humor, and addended with a helpful glossary of psychoanalytic terms, this book is divided into two parts, Trump’s Origins and Pathologies, which according to Frank, are closely related. To understand their relationship, Frank explores and explains the major factors that are psychoanalytically formative to the president’s development. Donald grew up in the long shadow of his older brother, Fred Jr., who, sadly, had so much pressure put on him to be successful and to follow in his father’s footsteps, that he failed utterly in this regard by succumbing to alcoholism and dying at the age of 43. Trump’s mother, Mary, appears to have been distant and detached from Donald, perhaps due to Fred Jr.’s difficult birth and her resultant convalescence of several years, or to her being the youngest of 10 Scottish immigrant children. After all, one cannot give what one did not get: It’s easy to imagine that by the time she came along, her parents lacked sufficient time and caring to go around. Fred Sr. loomed large in Donald’s life, which created intense ambivalence in the son toward the father, whether or not the president acknowledges his conflicted feelings or not. On the one hand, Fred Jr.’s decline into alcoholism and death offered the ever-competitive Donald a shot at becoming #1 son—yearning, dreaming and scheming to succeed in order to garner his father’s deeply needed approval. On the other, Fred Sr. was powerful, demanding, critical and narcissistically inclined, as well as success-driven and unscrupulous like his own father. Donald’s father was also emotionally and often physically absent from much of his childhood, creating in the boy, then man, a case of father hunger which we see in the president’s fawning adoration of dictators such as Putin, Duterte, Erdogan, Xi Jinping and even his mentor, Roy Cohn. A final blow to young Donald’s emotional development was his father’s last-ditch effort to correct his son’s anti-social behaviors, educational difficulties, and general rebelliousness by shipping him off in the eighth grade to live and learn at the New York Military Academy. Donald seems never to have gotten over feeling rejected and abandoned, viewing this act as a betrayal by his father. Frank lists a host of frequently cited unhealthy mental traits in the president such as binary thinking, grandiosity, projection, bullying, fear of weakness and shame, vengefulness, contempt, aggression, paranoia, manipulation, lack of empathy or compassion, hyper-vigilance, habitual lying, fear of persecution, and appearances of dissociation. These traits are all directed, albeit mostly unconsciously, to lowering the president’s overwhelming anxiety which skyrockets whenever he comes close to perceiving himself as defective in any way. Such are the traits of someone who mental health experts commonly label as having the personality disorder of Malignant Narcissism. As Frank explains, “. . . narcissism is a defense created to maintain the grandiose self and remains the primary defense against any threats to the child’s sense of omnipotence.” Or, as well, the adult’s sense of omnipotence, so that what seems to be unabashed self-love actually hides the unbearable secret need to be loved in order to feel lovable. Frank provides a few diagnoses that might surprise readers and which likely caused and continue to cause a considerable amount of Donald’s defensive and offensive behaviors. They make the reader wonder how he might have turned out if they’d been identified and treated in childhood. These diagnoses go a long way toward explaining why he detests being corrected and so vehemently denies that he said what we heard him say or insists that he said what he didn’t say. As explained by Frank, recognizing the president’s mental deficits and disorders makes it easier to understand his inclination toward the intolerance and contempt he expresses through racism, blatant sexism and misogyny. His views make sense due to his binary, other-versus-me thinking and urgent need to project negative feelings and thoughts that he can’t acknowledge in himself onto others in order not to feel vulnerable, weak or ashamed. We can also see his massive distrust of others as being rooted in having had parents whom he couldn’t depend on emotionally in a caring, consistent and loving way. How could he not be sexist, racist or misogynistic based on his fierce need to make others the bad guys so that he can (perpetually) see himself as the hero in every story. Frank provides an answer to the burning question that many anti-Trumpers ask themselves and each other: What kind of person would vote for and continue to support a man who is so obviously mentally disturbed and a danger to his country and the world? Frank’s compassionate explanation shows an astute understanding of how we, individually and as a society, are drawn to certain leaders as well as shaped by them. Sobering and frightening as his analysis of the president is, it is also a call to arms. This book is meant to educate in order to enlighten and to enlighten in order to thrust readers outside their comfort zone to take political action against the dangers of having a mentally unfit president. Karen R. Koenig is a psychotherapist, educator, author, and expert on the psychology of eating. Her most recent book is Helping Patients Outsmart Overeating: Psychological Strategies for Doctors and Health Care Providers (Rowman & Littlefield, 2017).